Rugby at Mossley Hill It’s a Knockout! 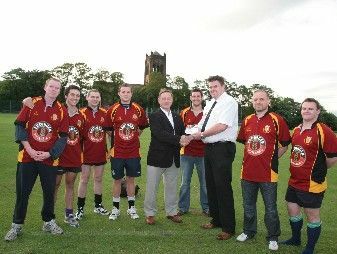 Mossley Hill Athletic Club rugby section recently raised £750 in the Liverpool Charity and Voluntary Services ‘It’s a Knockout’ competition. The event held on 28 June, to mark the LCVS centenary year was hosted at the club and was attended by a number of regional and national charities who collectively raised £10,000 by entering teams. (£50) which was a workplace prize for one of the team. Chairman of Rugby Keith Smith said “We were happy to have taken part and raised this money for the RNLI. They provide a service that none of us had used but one we always wanted to know was there. 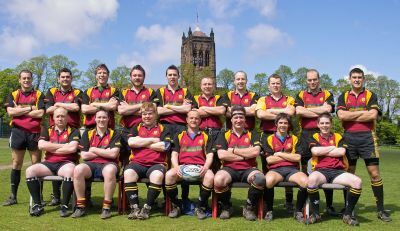 It is going to be an exciting year for Rugby at Mossley Hill. The club plans to start a junior section with Under 9s and Under 11s and hold a series of ‘friendly’ veterans’ games throughout the season. RFU development officer for Liverpool, Mark Sutcliffe today said, “There is not much competitive club rugby union played in Liverpool. Its good to see Mossley Hill starting a junior section, following in the successful footsteps of other local clubs Liverpool Collegiate and Sefton. This is great for the city. The RFU encourages all rugby development initiatives – particularly those in a football-loving place like Liverpool. Photo shows Mossley Hill secretary Edie McCarthy presenting the cheque to the RNLIs Steve Pearse.